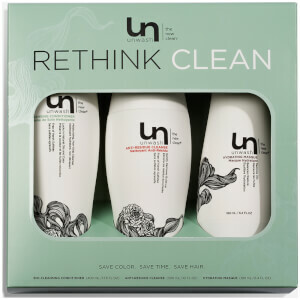 Achieve enviable locks with the Rethink Clean Kit from Unwash. Host to a trio of hair-loving products, the set guarantees to care for hair and leave tresses cleansed, conditioned and ultra-shiny. The kit boasts a nourishing conditioner, effective cleansing shampoo and moisturising hair mask, which combine to create a haircare regime that will create touchably soft, healthy looking hair. Discover a new level of clean with the Bio Cleansing Conditioner. Formulated without harsh chemicals, the innovative non-lathering formula eliminates dirt and oil from hair, without stripping essential moisture. Fortified with Cationic Cleansers, the conditioning formula draws unwanted dirt from locks, without disrupting the cuticle. A blend of organic Evening Primrose oil and Hydrolyzed Keratin works to nourish the hair and the scalp, delivering moisture and strength. Expect smooth, shiny and bouncy hair that is free from oil and frizz. Eliminate build up with the Anti-Residue Cleanse. Working to reset hair back to its ultra-clean state, the cleansing formula works to rid hair of daily build up, including oil and hair products. Gentle yet effective, the shampoo is formulated without sulphate detergents and is able to perform a thorough cleanse without stripping hair of its natural oils. The formula is enriched with Cocamide Dipa, alongside Coconut and Babassu Oils, which help to moisturise hair whilst offering a gentle cleanse. Finished with Moringa Oleifera Seed Oil, the shampoo leaves the scalp calm and comfortable and hair incredibly shiny. Replenish your locks with the Hydrating Masque. Smoothing effortlessly onto hair, the hydrating masque reveals locks full of body and vitality. Fortified with organic Argan oil, the nourishing formula delivers intense hydration to hair in need. The hair cuticle is smoothed, which helps to reduce frizz and increase shine. The hair mask is complete with protein-rich Hydrolysed Quinoa, which protects and repairs the fiber for a silkier finish. Expect hydrated locks that are touchably soft and shiny. Conditioner: Fully wet hair to allow product to evenly saturate. Gather a small amount and apply from roots to ends. Concentrate massage into areas with excess buildup and oil. Rinse thoroughly. Cleanse: Fully wet hair and allow product to evenly saturate. Gather a small amount and apply from roots to ends. Focus massage into areas with excess buildup and oil. Rinse thoroughly. Masque: Fully wet hair. Use a small amount and apply product from roots to ends, leaving in for 3-5 minutes to smooth and repair. Rinse thoroughly. Conditioner: Aqua (Water), Cetearyl Alcohol, Trimethylsilylamodimethicone, C11-15 Pareth-7, Behentrimonium Methosulfate, C12-15 Pareth-9, Glycerin, Polysorbate 60, Trideceth-12, Cetrimonium Chloride, Panthenol, Parfum, Tetrasodium Glutamate Diacetate, Hippophae Rhamnoides Extract, Cannabis Sativa Seed Oil (Hemp Seed Oil), Borago Officinalis Seed Oil, Citric Acid, Borage Seed Oil, Oenothera Biennis Oil, Linum Usitatissimum Oil, Hydrolyzed Vegetable Protein PG-propyl Silanetriol, Hydrolyzed Keratin, Methylchloroisothiazolinone & Methylisothiazolinone, Benzyl Alcohol, Benzyl Salicylate, Hydroxyisohexyl 3-cyclohexene carboxaldehyde, Hexyl Cinnamal. Cleanse: Aqua (Water), Sodium C14-16 Olefin Sulfonate, Sodium Lauryl Sulfoacetate, Disodium Laureth Sulfosuccinate, Cocamidopropyl Betaine, Cocamidopropyl Hydroxysultaine, Cocamide DIPA, Cocamidopropylamine Oxide, Panthenyl Hydroxypropyl Steardimonium Chloride, Caprylyl/Capryl Glucoside, Glycerin, Ammonium Chloride, Parfum, Tetrasodium Glutamate Diacetate, Simmondsia Chinensis Oil, Cocos Nucifera Oil, Moringa Oleifera Seed Oil, Orbignya Oleifera Oil, Citric Acid, Sodium Benzoate, Potassium Sorbate, Methylchloroisothiazolinone & Methylisothiazolinone, Benzyl Alcohol, Benzyl Salicylate, Hydroxyisohexyl 3-Cyclohexene Carboxaldehyde, Hexyl Cinnamal. Masque: Aqua (Water), Amodimethicone, Cetearyl Alcohol, Cetyl Alcohol, Stearyl Alcohol, Cetrimonium Chloride, Behentrimonium Chloride, Stearalkonium Chloride, Panthenol, Polyquaternium-37, Hydrolyzed Quinoa, Saccharide Hydrolysate, Hydrolyzed Linseed Extract, Aminopropyl Phenyl Trimethicone, Stearamidopropyl Dimethylamine, Isopropyl Palmitate, Cocos Nucifera Oil, Dicaprylyl Carbonate, Polysorbate 60, Behenyl Alcohol, Lauryl Glucoside, Saccharum Officinarum Extract, Trideceth-12, Parfum, Citrus Grandis Oil, Silk Amino Acids, Citrus Medica Limonum Peel Extract, Citrus Aurantium Dulcis Extract, Pyrus Malus Extract, Camelia Sinensis Extract, Limnanthes Alba Seed Oil, Disodium EDTA, Glycerin, Borago Officinalis Seed Oil, Hydrolyzed Vegetable Protein Pg-propyl Silanetriol, Cannabis Sativa Seed Oil, Argania Spinosa Oil, Hippophae Rhamnoides Extract, Betaglucan, Oenothera Biennis Oil, Linum Usitatissimum Oil, Sodium Hydroxide Methylchloroisothiazolinone & Methylisothiazolinone, Hydrolyzed Keratin, Phenoxyethanol, Sorbic Acid, Benzyl Alcohol, Benzyl Salicylate, Hydroxyisohexyl 3-Cyclohexene Carboxaldehyde, Hexyl Cinnamal, Limonene. Conditioner: 400ml / Cleanse: 300ml / Masque: 190ml.